While helping her sister find her toy on the shores of what the Europeans called Florida, Elanu-Y-Mara, or Mara, is captured by pirates and taken aboard a slaver called the Devil Ray. Furious yet frightened, Mara is aware of the danger associated with her captives. 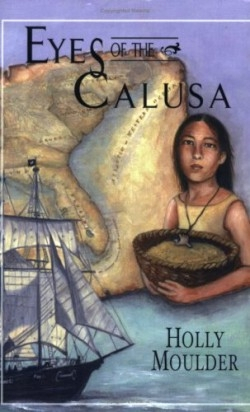 Initially, “She wondered if she was to be a prisoner of these dreaded white-skinned Europeans, those who had brought disease and death to her ancestors.” When she looks into the captain’s eyes—a practice the Calusa people believed provided insight into a person’s soul—what she sees confirms her thoughts of being sold into slavery as many of her ancestors were. While on the ship, Mara befriends Samuel, an African slave who teaches her English. She later proves she is resourceful, intelligent, and brave by saving the ship and crew during a violent storm. On a plantation in Charleston, South Carolina, owned by “good white people,” Mara is forced to haul buckets of urine used to make indigo. She devotes herself to using knowledge derived from the Calusa to make life easier for the Stanleys. While Mara realizes owning human beings is wrong and she wants to be free, at times she seems resigned to a life of slavery. The novel’s major dilemma develops out of her personal convictions about obtaining freedom. When Mara overhears a group of slaves plotting to kill the Stanleys in demand of freedom, she decides that it would be unethical to allow the men to murder her owners. Instead, she risks her life and the lives of others to keep the Stanleys safe. “[Mara] was startled by her sudden revelation that a human life, even the life of a slave owner, was more valuable than her own freedom,” Moulder writes. Simply-drawn illustrations of objects (i.e., a spyglass, a tree, a boat) connected to each of the three parts of the story preface each chapter. The first-time illustrator earned a degree in interior design from Bauder College. The author, a former elementary school teacher in Newman, Georgia, lives in Sharpsburg, Georgia. This is her first book. This historical novel was inspired by the author’s love of history and knowledge of the Calusa people and everything they lost as a result of the European presence in Florida. A carefully written author’s note provides titles of sources for those who would like to read about the Calusa, indigo planting, life on a plantation, and more.